EJSS Earth and Moon Model by paco remixed by lookang. The Moon completes its orbit around the Earth in approximately 27.32 days (a sidereal month). 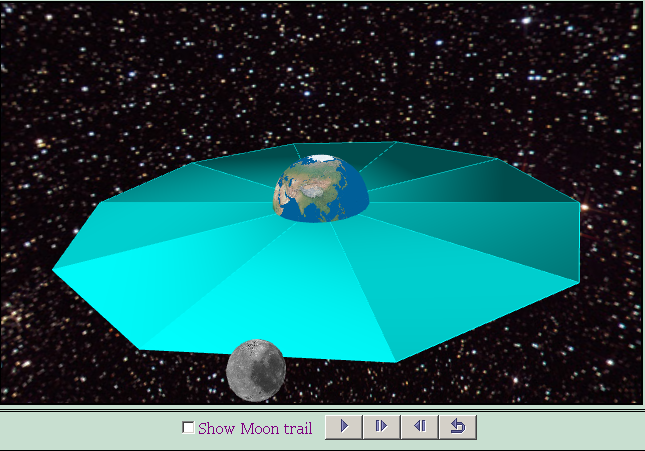 In this model, we assume the Moon to orbit about the center of the Earth. By this assumption, the Moon is at a distance of about 385000 km from the center of the Earth, which corresponds to about 60 Earth radii. With a mean orbital velocity of 1.023 km/s, The Moon orbit is modeled to be a perfect circular motion orbit, a close approximation the real Moon's orbit. 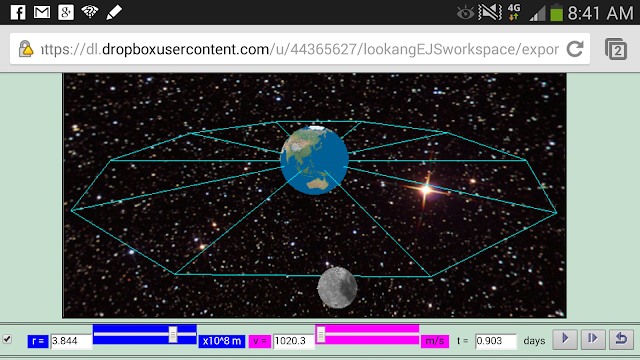 The model also assume the Moon to move on the Earth's equatorial plane. in order to create realistic simulation, the model used constants to create numeric that corresponds to the real world. set the velocity to zero and play the simulation, is it as you expected it to observe? What is the physics concepts that can be used to explain this?